Most working moms have the same struggle- you have tons to accomplish, but you never have enough time. After a long day of work, you have to still cook dinner, clean the house, prep for the next day and somehow find time to bond with your family. 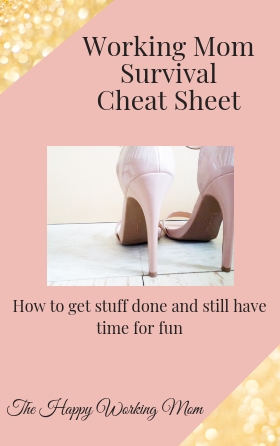 Well here are some tips to help you get stuff done even though you don't have time. 1) Take the time to shift your mindset: When you become a mom, it's important to realize that your life is going to change. Your life is no longer your own, you will get less sleep, you can't just pick up and leave whenever you want, your body will change in ways you never imagined and on and on it goes. Now instead of fighting to maintain the identity you had before, realize that life as you know it has changed. Lean into your new identity, and find new ways to enjoy your new life. Yes you can't just pick up and go, so plan activities around your baby. Can't go to the movies? Plan an in home movie experience. Can't go to a concert? Invite some people over for a dance session when the baby is asleep. Find new things you like, try new experiences and let go of the old you. It's a lot easier that you think, I promise. 2) Get to know yourself: So of course the moment you become a mom, your life changes-we all know that. But you spend so much time being fixated on your new, sweet baby that you forget to create space for yourself. Motherhood changes us. Spend time creating new interests for yourself that can fit into your new schedule. It takes some getting used to but if you don't connect with yourself, you'll eventually wake up one morning and not know who you are. 3) Find other mom friends to connect with: When I became a mom, I found myself feeling isolated and frustrated. I felt like I had no one to talk to, all of my non mom friends could not relate to my struggles. Eventually I just gave up and decided to live in my own misery. Now what I should have done is, I should have persisted, and I should have found one or two moms who clicked with me. Isolation does you no good. 4) Don't struggle silently: So when you're having those difficult nights when your baby isn't sleeping, your breastmilk isn't coming out and you're just not feeling cute, say that to someone. This is how you can form connections with others. When you share your problems with others, you'll realize that they too might be going through the same thing. What steps can you take to avoid losing your identity?